A Beechcraft B58 Baron skidded on a wet grass runway and collided with a parked Piper PA-32 (N88NA). 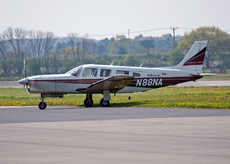 There were four persons on board the Beechcraft Baron - a pilot and three passengers. Two of the passengers were named as Richard Hannon, a racehorse trainer, and Anna Lisa Balding, who attracted media interest in the accident as she is the sister of BBC TV Sports Commentator Claire Balding. Also on board were Richard Hannon’s twin brother, Henry, and apprentice jockey Gary Mahon. The Piper Saratoga was empty (unoccupied) at the time of the impact. Anna Balding said: "Our pilot did an amazing job in really bad weather conditions. I don't know what happened, I am no pilot, But I know I saw my life slip away from me very quickly. But we are all alive, it was a bit scary. I'm going to try and get home safely. I will be going in the lorry. But when you have a winner you don't mind how you get home." Haydock Park clerk of the course Kirkland Tellwright said: "The bigger plane coming in skidded on landing, apparently spun and clipped the smaller plane. No one was hurt, but neither plane will be flying today." A spokesperson said: "First and most importantly we are glad that no one has been hurt. The racecourse airfield is constantly maintained, was inspected before racing and passed in full working order, and has an operative based there. The previous plane landed reporting no issues whatsoever and indeed no pilot has apportioned any blame to the airstrip. In line with protocol in these circumstances we have closed the airfield and handed the matter over to the Aircraft Accident Investigation Bureau"